The town of Irving is a great place to settle down and raise a family. Or is it? Beneath the pleasant façade of this quiet little town lies a dark underside. When a savage hate crime is committed on the grounds of the town's high school, the residents of Irving must come to terms with their own prejudices and face the facts that all is not as it seems in a town like Irving. An unflinching look at the hypocrisies of middle America. "A masterful work, a solid drama that explores the sinister edge that lurks beneath even the friendliest demeanor." "A gripping, well-crafted piece that earns the tears it elicits." "While The Laramie Project is not likely to be pushed off its pedestal (which it deserves), A Town Like Irving may well be the better play. It infuses the event with the art in a classic formula that fires the imagination." 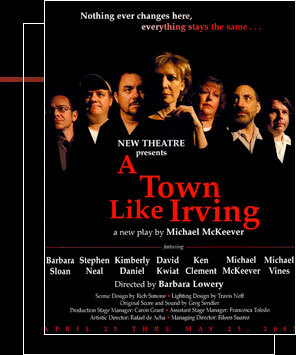 2003 Miami Herald "Top Ten Theatrical Events"
2003 Sun-Sentinel "10 Best Plays of the Year"